The Greek community participates enthusiastically in the UDance fundraiser benefiting the B+ Foundation. ON THE GREEN | Alpha, Beta, Gamma, Delta, Epsilon, Zeta…These might be nothing more than vaguely familiar letters of the Greek alphabet to some, but for thousands of UD students and alumni, they hold significance for academics, philanthropy and brotherhood. “Academically, Greek life is strong, but what many people don’t realize is how much these chapters do to give back,” says Adam Cantley, UD’s assistant director for fraternity and sorority life. Last spring alone, Greek organizations raised more than $200,000 for charities and contributed 16,000 hours of community service. While each of these organizations has its own designated charity, such as the “I Have a Dream” Foundation for Children for Chi Upsilon Sigma and the American Red Cross for Theta Chi, the other chapters support one another’s causes, too. 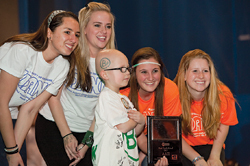 One event that brings together the entire UD Greek nation is UDance, a registered student organization that hosts a spring fundraiser to help fight childhood cancer through the B+ Foundation. One of Alpha Delta Pi’s philanthropic causes is B+, which junior Laura Simpler says is special because the organization was created in honor of Andrew McDonough—the brother of one of her sorority sisters, Ali McDonough. 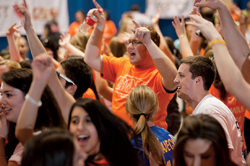 Of the more than $250,000 raised for UDance in spring 2011, 10 percent of that total came from UD’s chapter of Alpha Delta Pi. Aside from the money, Simpler says that it’s supporting the B+ Heroes—those children who have battled or are still battling cancer—that makes participating in the event so fulfilling. “It’s amazing to see how excited the B+ Heroes get because the event is for them,” she says. Mendez adds that collaborating with other chapters and networking with other Greeks at events like UDance is part of what makes such a strong community at UD. “While we’re here, we work to build a large network,” he says. “And many Greeks, including myself, want to see their chapter grow and prosper after they leave.” In his role as president, Mendez says it is important to see not only his own chapter but all 17 fraternities that comprise the Interfraternity Council succeed and thrive. As assistant recruitment chair of the Panhellenic Council, Simpler says there is so much behind-the-scenes work to keep the chapters going and growing that many Greeks do not realize the full extent of activities until they take on such a leadership role. “As soon as recruitment ends in the spring, we start planning for the next year,” she says. Despite the hard work and numerous hours that go into recruitment and planning events, Cantley says it is an experience that prepares students for life after graduation.